A public hearing is scheduled for Tuesday, June 26, 2018 at 6:00pm at the Augusta Armory, Room 209, 179 Western Avenue in Augusta regarding the proposed antlerless deer permit numbers for the 2018 regular deer hunting season and special muzzle-loading season. Members of the public are encouraged to attend the public hearing. Click HERE for full proposal details and additional information. McDonald’s Told: Stop Bowing to Liberal Pressure Groups! Oak Brook, IL / Washington, D.C. – At today’s annual meeting of McDonald’s shareholders held in Oak Brook, Illinois, a representative of the National Center for Public Policy Research presented a shareholder resolution urging the fast food giant to alter its strategy of catering to leftist activists on wage and other economic issues. At last year’s shareholder meeting, the company crowed about artificially increasing the minimum wage for some of its workers. Well the barbarians are back at your gate demanding more – they did not see your concession as a victory for workers – they saw it as a sign of weakness which they can exploit. With less economic understanding than the Socialist Senator from Vermont, they demand wage increases that would shutter most McDonald’s locations. You should be screaming this from the rooftops, not relying on pro-free enterprise groups to do it for you. But there’s the rub because when radical liberal activists spread lies about the American Legislative Exchange Council (ALEC), a well-regarded 40-year-old organization that McDonald’s joined because it works to reduce our taxes and to ease the regulatory burden upon our operations, McDonald’s was one of the first organizations in the country to cave in and withdraw its membership. The full text of Danhof’s remarks at the McDonald’s meeting, as prepared for delivery, can be found here. Danhof also presented a resolution at last year’s McDonald’s shareholder meeting. Danhof presented today’s and 2015’s resolution on behalf of National Center Chairman Amy Ridenour, a McDonald’s shareholder. The full text of Ridenour’s 2016 proposal, and McDonald’s reply, can be found on pages 58-59 of the company’s proxy statement, which is available here. The final vote count is not yet available. The National Center’s Free Enterprise Project is the nation’s preeminent free-market activist group focusing on shareholder activism and the confluence of big government and big business. In 2014-15, National Center representatives participated in 69 shareholder meetings advancing free-market ideals in the areas of health care, energy, taxes, subsidies, regulations, religious freedom, food policies, media bias, gun rights, workers’ rights and many other important public policy issues. Today’s McDonald’s meeting marks its fifteenth shareholder meeting of 2016. The National Center for Public Policy Research, founded in 1982, is a non-partisan, free-market, independent conservative think-tank. Ninety-four percent of its support comes from individuals, less than four percent from foundations, and less than two percent from corporations. 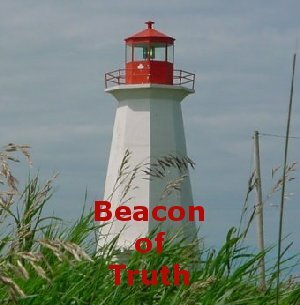 It receives over 350,000 individual contributions a year from over 96,000 active recent contributors. Sign up for free issue alerts here or follow us on Twitter at @NationalCenter. The Maine Department of Inland Fisheries and Wildlife (MDIFW) is embarking on a study to revise its longterm fisheries management plan. There have been several opportunities for angler input into the process, including a scientific survey and a series of focus groups (licensed resident and nonresident anglers were randomly selected to participate in each). 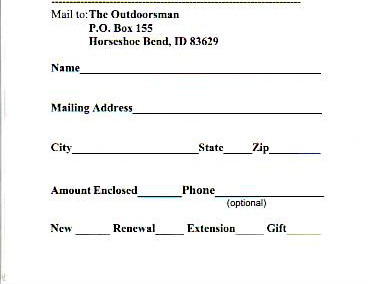 However, MDIFW wants to hear from all anglers, and there are two ways you can be involved in the process. The first is through an online “Town Hall” forum allowing anglers to submit comments to the agency and discuss fisheries management with one another. The fisheries Town Hall forum can be accessed here: www.mefish.org. Many anglers in Maine are also hunters and landowners, and a similar research process is being conducted to update MDIFW’s big game management plan. An online Town Hall for big game management issues is accessible at www.metownhall.org. Thank you for your interest in Maine’s fish and wildlife resources. We hope to hear from you soon. The Water Rights Compact (treaty) recently signed by the Confederated Salish & Kootenai Tribes, the State of Montana and the U.S. Department of Interior is a complex, first-of-its-kind agreement that will seriously impair the rights of Montana land and water rights holders, including CSKT Tribal members. The Compact also will reshape, for the worse, future water rights compacts currently being contemplated by other U.S. states and regions (including in Alaska, Arizona, California, Hawaii, Oklahoma, the Midwest and the East). The Water Rights Compact must first be approved by Congress before it can be implemented by the Parties. This means that Congress will have the opportunity to closely examine the processes these Parties employed to enter into the Compact as well as the Compact’s specific terms, andthat Congress bears the primary legal and fiduciary responsibility for ensuring that such processes and terms, as defined and as to be applied, willnot violate federal, state and/or tribal laws and the U.S., State and Tribal constitutional rights of Montana’s citizens. · Robert Fanning, former Republican Candidate for Governor (2012). Given Congress’ indispensable role in reviewing the Water Compact, it has been confirmed that top aides from both congressional offices will have senior representatives in attendance. We would be honored to have you come and listen to their presentations, and we welcome your constructive inputs. Thursday, May 7, 2015 9:00 a.m. – 5:00 p.m. AGENDA ITEM NO. 8: Request from Turner Endangered Species Fund to Import and Possess Mexican Gray Wolves. 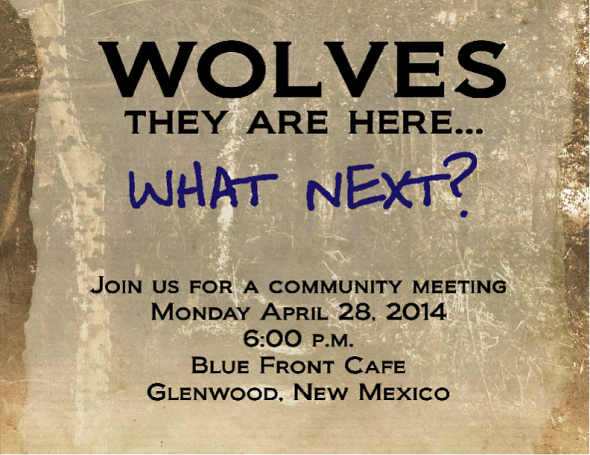 Presented by Mike Phillips – The Turner Endangered Species Fund will present a request to bring Mexican gray wolves into New Mexico to be placed at the Ladder Ranch (a private property) as part of an endangered species recovery program. AGENDA ITEM NO. 15: Bear and Cougar Rule Development – 19.31.11 NMAC for the 2016-2020 Seasons. Presented by Elise Goldstein – The Department will present proposed changes to the Bear and Cougar rule (19.31.11 NMAC) based on public comment, harvest data, population status, and other impacts. Yesterday I posted a press release from the Maine Trappers Association with information about trapping rule changes as they pertain to trapping in Canada lynx habitat areas. In that press release, there was information about a meeting planned to discuss lynx issues. The date of that meeting is scheduled for January 4, 2015 at 9:00 a.m. at the Bangor Motor Lodge in Bangor, Maine. Wolf meeting tomorrow, 8-13-14 at the TorC civic center. 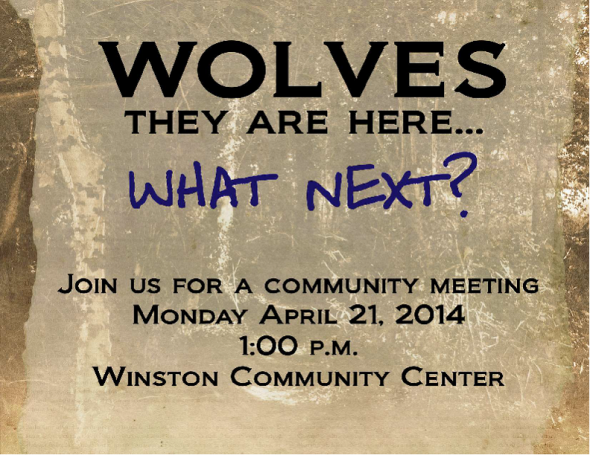 Public input meeting at 6 PM; information session from fish nd wildlife service at 2 PM. [This is]About the new proposed draft rule and Environmental Impact Statement the rule is based on. Please come and speak if you can. Map and short zone explanation attached. Talking points attached. • Zone 1 is an area within the MWEPA where Mexican wolves would be allowed to occupy and where wolves may be initially released or translocated. Zone 1 would include all of the Apache and Gila National Forests (the existing BRWRA) and any or all of the Sitgreaves National Forests; the Payson, Pleasant Valley, andTonto Basin Ranger Districts of the Tonto National Forest; and the Magdalena Ranger District of the Cibola National Forest. 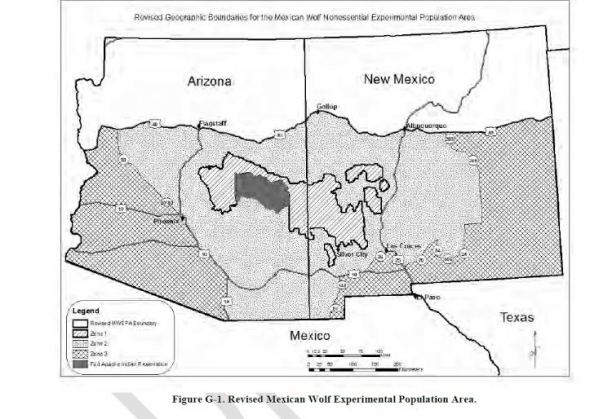 • Zone 3 is an area where Mexican wolves would be allowed to naturally disperse into and occupy but where neither initial releases nor translocations would occur. Zone 3 would include the area of the MWEPA not included in Zone1 or 2 south of I-40 to the international border with Mexico. 2. Recovery planning needs a defined number of wolves to allow the public to understand clearly the objectives of the recovery of Mexican wolves in the SW.
3. Livestock on federally administered grazing allotments are private property legally occupying the range to disallow take of wolves attacking livestock is wrong. Ranchers should be allowed to defend and protect their domestic animals regardless of land ownership, without having to beg for a permit. 4. FWS isn’t using best available science or information in the DEIS. Nowhere is there a requirement that county data and reports must be peer reviewed to be used by the agency in rulemaking. Thus far FWS has cited no data to support the finding of no significant impact to livestock community by this program, nor the harm that has been documented to the human element particularly the children in areas where wolves are present. 5. FWS failed to mitigate livestock depredation and ranch sales due to wolf depredation in wolf occupied areas. nothing in their draft suggests they will do so this time. 6. FWS has failed to mitigate the impacts to children in wolf populated areas, in fact have largely ignored the habituation problem of these wolves. There is very little in the DEIS and Draft Rule that allows for mitigation of these significant problems. 7. FWS has failed to consider cumulative effect of economic losses and social impacts when this program is coupled with all the other environmental planning that is going on in our state. 8. FWS has failed to address catastrophic affects on wolf habitat. 9. 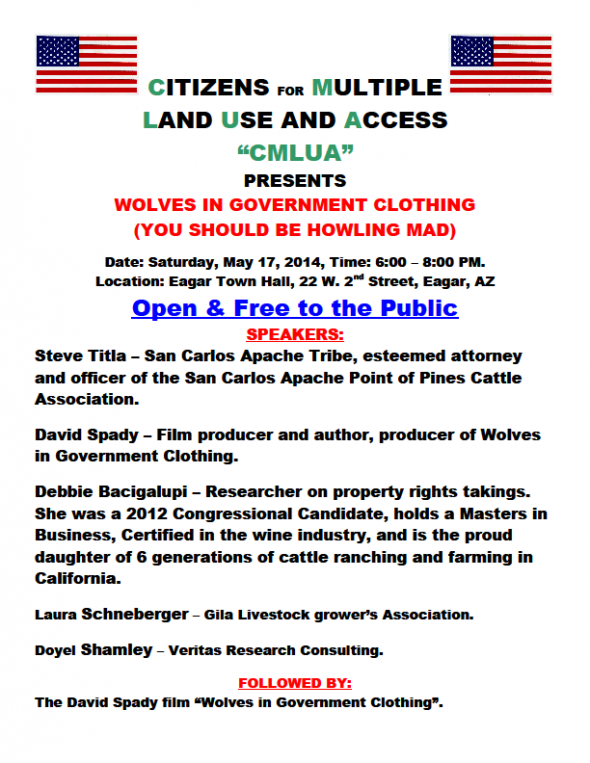 Cooperative agreements with private landowners to host wolves on private land can and likely will have significant impact on neighboring ranches domestic animals and the human element on adjacent private lands, this should not be available. 10. FWS must stay within the bounds of the DEIS and draft Rule, during the last rulemaking process, David Parsons significantly changed the draft rule and EIS and there was no public vetting of his teams decision-making. This DEIS cannot be significantly altered other than to incorporate ongoing comments in the current commenting cycle. Parsons now works for an environmental organization devoted to preserving predators. Remember, DOW CBD WEG Sierra Club and all the other environmental and animal rights organizations, will be bussing in people to speak, crowding the comment session and complicating this meeting with public grandstandings perhaps even a howl in like they did in Albuquerque last year. It got them a cover on the Albuquerque Journal. If you are up to a little public grandstanding to ensure the media gets our side of the story feel free to do so, I have protest signs and we can stage a protest ourselves if necessary. Public comment session, stick to realistic points similar to but not limited to those above, and the injustice and unfairness behind the management of the program. There is no, No Wolves alternative, this program is far far beyond that issue the reality is, the courts have ruled this is legitimate. 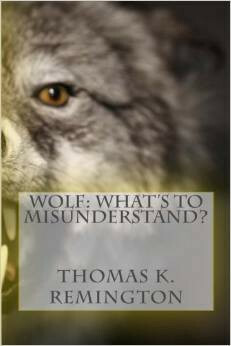 Even if there was a No Wolves alternative, and it was chosen, the population explosion we have now would allow the agency to immediately re-list this animal with full ESA status critical habitat and a no take policy under the ESA and there would be wolves out here forever with NO removals for problem animals and private property curtailment due to the critical habitat status. Within the past year our association Gila Livestock Growers Assn. has tried to fulfill some basic scientific testing that would have allowed us the basis for petitioning for de-listing of this animal along with the de-listing of the northern population, our access to historic samples fell through and our time has run out to do it before the new rule is in place. We will have to undergo the rulemaking process and try to find historic samples for testing at a later date. At this meeting, we have to show the agency they will not and cannot get away with pretending there is no significant impact to our communities and industries whether it’s tourism, ranching or outfitting. pick a subject stay on point ignore the hecklers. Prepare for bizarre and really bad behavior from the wolf support activists. 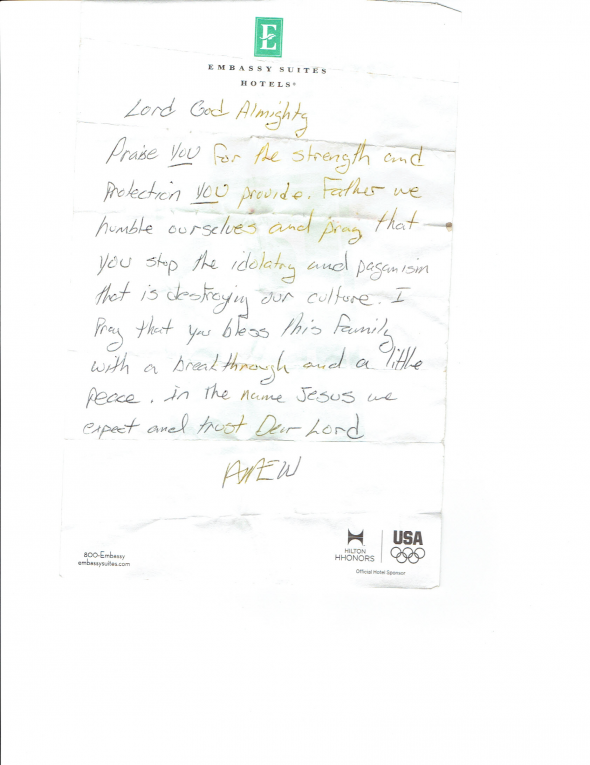 When I was in Albuquerque last November for the preliminary meetings someone sat next to me and handed me the prayer attached here. Please print it and take it with you if you need to.